I can't even tell you how often I made these oven 'fried' chicken wings over the years but I never get around to sharing them here. Something about summer though, makes me want to make these easy to toss together wings even more often. Now with The World Cup in Brazil (Go USA!) you won't believe how many batches we devoured during the tournament and we still have the round of 16 to go. It usually goes like this...oven 'fried' Buffalo chicken wings or with this BBQ sauce and on occasion an Indian version with curry mixed into the flour! Honestly though these chicken wings are delicious even without any sauces or flavoring at all, just as is coming out of the oven. To complete the summer feast I serve with the wings corn on the cob, this smokey salsa and the famed Rosa Mexicano's guac! S's high school friends, who graduated from college this year (Congrats to all! ), were by to watch one of The World Cup games, said it's the best guac they ever had. They've never been to Rosa's! I also have some carrot and celery sticks cut up to go along with this lemon dill aioli which I absolutely love. Once you've made these succulent from the inside, crisp from the outside wings, you will never go back to deep frying. Keeping this post short and sweet. Enjoy the sunshine, the game of soccer (futbol) and Happy 4th of July weekend, everyone! Toss the chicken wing pieces in a large bowl with the salt and the oil and mix. In a measuring cup, add the flour and black pepper and mix. Place the chicken wing pieces into a large Ziploc bag and add the flour. Zip and shake lightly so all pieces are evenly coated with flour. Shake lightly any excess flour and place on an oiled foiled* cookie sheet with some space in between the chicken wing pieces. Do not crowd the chicken wings. Cook for 25 minutes on one side and then 15 minutes longer on the other side. 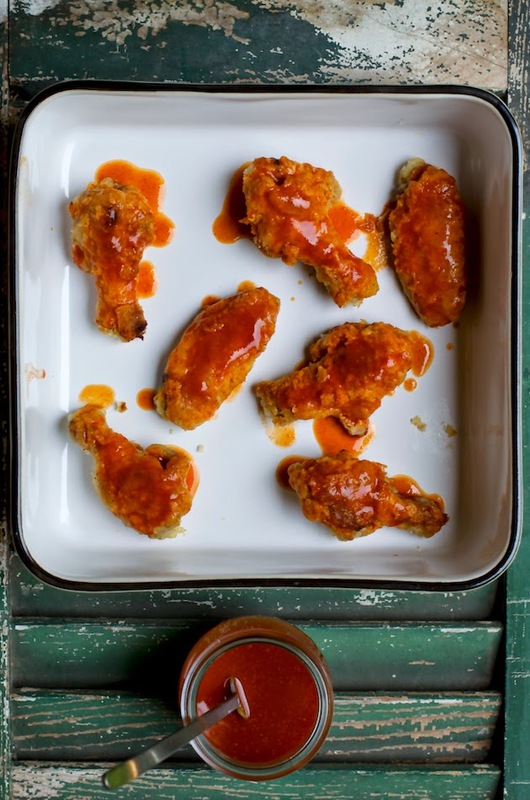 While the chicken wings are oven 'frying,' mix all the sauce ingredients in a small sauce pan, bring to a simmer and turn off the heat. 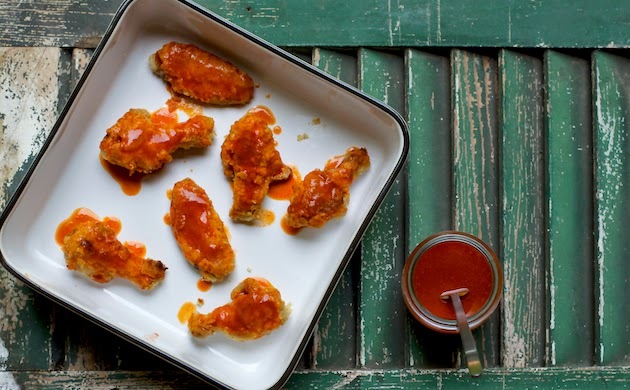 Once the chicken wings are cooked, spoon some sauce over each chicken wing or remove into a serving bowl and pour the sauce over the chicken wings to coat well. *I find that even with oiled foil, the wings tend to stick a bit, so I use for years now un-oiled If You Care brand parchment paper. Parchment paper has a reputation to burn at high temperatures. However, based on my experience this one doesn't. Keep in mind ovens vary and you might get different results with the parchment paper. Shulie, your buffalo wings sound delicious! 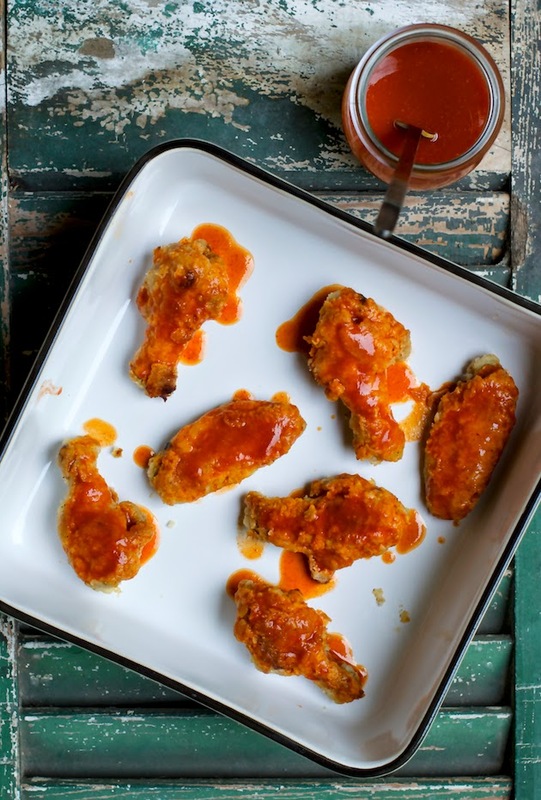 I love chicken wings... they are yummy and so economical too! Wow! what a fantastic sauce, my hubby would love these! Fingerlicking good! I love chicken wings and all the ingredients you've used for the sauce. Oh boy. These look totally delicious. I might do myself some damage if I was around a whole pan of them... in a good way. I'm a sucker for good wings! Pinned. Mmmmm, I love chicken wings smothered in BBQ sauce! Shulie, sounds delicious! And I'd much rather use the oven than get into a deep-frying mess! They look incredible. We have an Airfryer and they would be perfect to go in this! I love chicken wings and yours looks oh so delicious, I must try your sauce! These look fantastic! Plus I love not having to deep fry them. I'm going to have to try the curry powder tip too, yum! Super cool post. Lovely pictures.